Portland's Pearl District has really set the bar nationally for a successful live/work/play neighborhood. Here you'll find a huge variety of condominium and loft styles, from authentic lofts like Chown Pella to modern high-rise towers like The Cosmopolitan. And they're all located near great shopping and dining. This is what green living is all about: living with a small carbon footprint in a building that is centrally located so you can walk or use public transportation. Our office is here in the Pearl so we know the neighborhood well and are ready to help however we can. Come by and see us in the ground floor of the Waterfront Pearl on Naito. Below are all available Pearl condos for sale today. 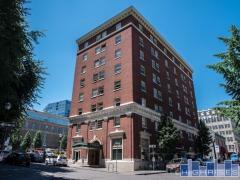 If you'd prefer you can search by building in our Pearl District Building Directory.